Charlie Smith is a sweet, sweet Gallery of interesting art in an unpretentious space. Perhaps also its location upstairs in The Reliance on Old street, or that the gallery often has group shows of up and coming artists, is why I enjoy it so much. 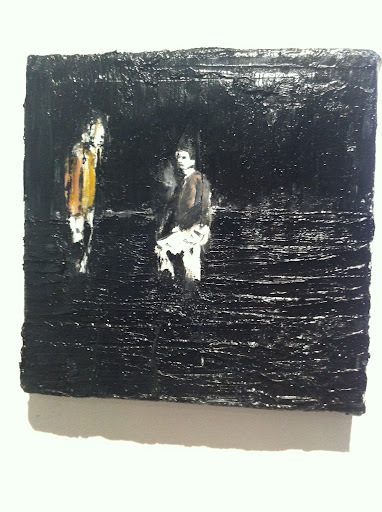 I walked into the space and was confronted by thick, black, textured paintings with a flash of colour. But wait, there was something going on in the surface of the paintings. Some kind of figure or groups of figures…. 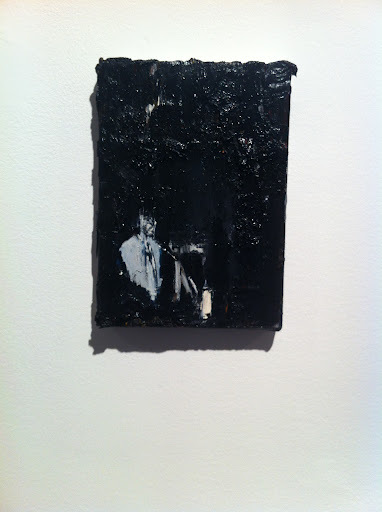 surrounded by a gooey, black tar like surface of thick glossy paint. Are they tourists in an oil slick or holidaying in hell? Why are they good TOURISTS? I read the press release from Charlie Smith Gallery to find out more about Luke Jackson. Tourism is travel for recreational, leisure or business purposes. The World Tourism Organization defines tourists as people “traveling to and staying in places outside their usual environment for not more than one consecutive year for leisure, business and other purposes.” So tourism in the artwork is the images out of context, floating, suspended in a nowhere place, and a nowhere time, in painterly marks and thick glossy surfaces. 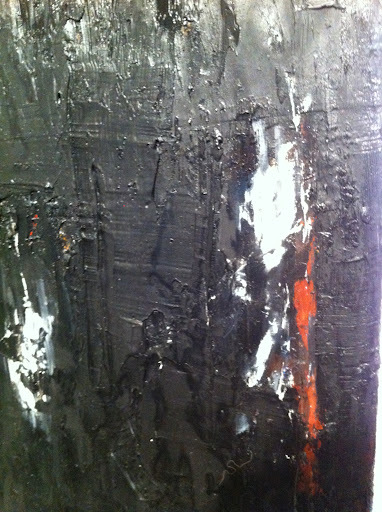 In a way, the figures are forced to be permanent and always present, as they are deeply embedded into this surface. As the definition of a tourists suggest, they might need to vacate in under a year, but this is not possible, as they seemed trapped. 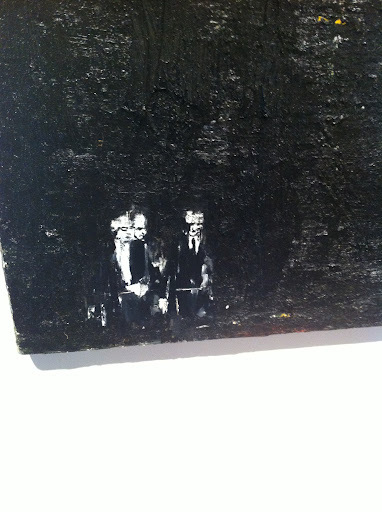 The figures do not notice the painterly blackness and do not connect or engage with it. 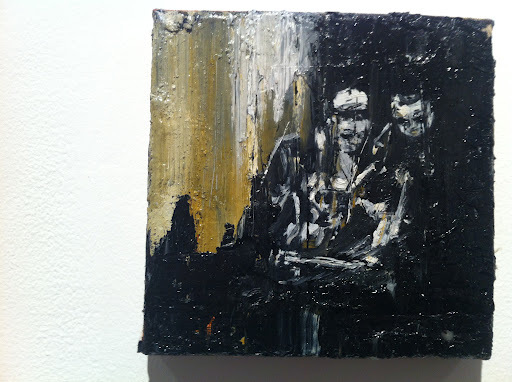 There is a clear separation and yet a connection between the arrangement of figures emerging from the black goo and the black goo itself, which conceals, reveals, protects and captures. Upon further reading, I think Jackson wants the viewer to question the role of painting and of historic image and so the painting process is a way of combining ideas on to one surface to create a complete concept with history acting as an informer to his work. 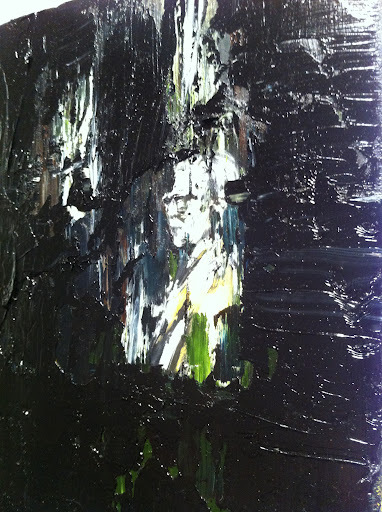 Now would the enigma of The Good Tourist exhibition be created by the two opposing motifs (of figures and black impasto surface) purposefully disguising any clear context for the viewer. Not only that, but the title throws another dimension to the artwork. Why are they good tourists? The work definitely has made me question the meaning behind Jackson’s practice. There is simplicity in that Jackson approaches painting and image in a straight forward way, in regards to their physicality, but then the paintings become weighty with conceptual ambiguity and slippages. The works seems to hover between poles of figuration+abstraction, concept+skill, detail+obliteration and form+content. Is the viewer the good tourist that hovers uncertainly from one artistic code to another and is prevented from settling? The viewer succumbs to that mental nowhere land of Jackson’s and therefore obeys? Good tourist?